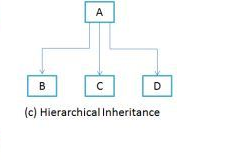 Below are Various types of inheritance in Java. We will see each one of them one by one with the help of examples and flow diagrams. “Multiple Inheritance” refers to the concept of one class extending (Or inherits) more than one base class. The inheritance we learnt earlier had the concept of one base class or parent. The problem with “multiple inheritance” is that the derived class will have to manage the dependency on two base classes. Note 1: Multiple Inheritance is very rarely used in software projects. Using Multiple inheritance often leads to problems in the hierarchy. This results in unwanted complexity when further extending the class. Note 2: Most of the new OO languages like Small Talk, Java, C# do not support Multiple inheritance. Multiple Inheritance is supported in C++. In such kind of inheritance one class is inherited by many sub classes. In below example class B,C and D inherits the same class A. A is parent class (or base class) of B,C & D. Read More at – Hierarchical Inheritance in java with example program. In simple terms you can say that Hybrid inheritance is a combination of Single and Multiple inheritance. A typical flow diagram would look like below. 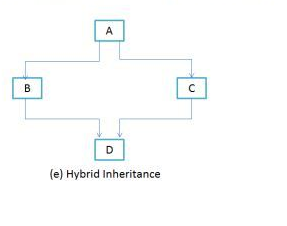 A hybrid inheritance can be achieved in the java in a same way as multiple inheritance can be!! Using interfaces. yes you heard it right. By using interfaces you can have multiple as well as hybrid inheritance in Java. Read the full article here – hybrid inheritance in java with example program. explain the Hybrid Inheritance with example in details ? 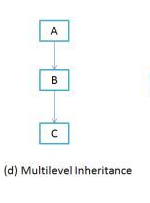 multiple-inheritance supported in java through interface ,so go through interface topic. finally what is the answer? does java supports multiple inheritance?????????????????????? because i cant understand ..on the top its written that java does support but on the otherhand it says that it doesnt. Java does not support Multiple inheritance or Hybrid inheritance directly!!!! BUT……it can be implemented using Interfaces as described above in the article!!!(Jugaad)!! There is no multiple inheritance in java, even with interface. we are indirectly just achieving it because in interface we are just extending only the empty methods, not the body. I need the multiple, hybrid, hierarchical inheritance example programs…. Hey Lenin, Please refer the links provided in the post for the examples of each type of inheritance. You DO NOT inherit from interfaces!! Nothing is defined in an interface therefore you have nothing to inherit. You IMPLEMENT an interface, and yes you can implement multiple interfaces in Java. Java DOES NOT allow for multiple inheritance or hybrid inheritance (diamond inheritance). Nice and helpful brief explanation, even for beginner or for some one who just wants to brush up the knowledge.